I am in LOVE with my nail polish choice this week! While on a weekend getaway to Chicago, I indulged in manicures at Bliss with a couple girlfriends. 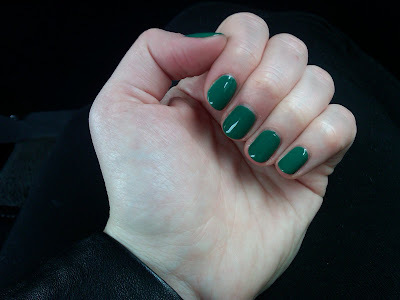 Lo and behold, they had OPI Jade is the New Black sitting on their polish shelf! I'm used to seeing only Essie polishes at Bliss, so this was quite a welcome change. This nail polish is one of the creamiest, richest greens I've yet to come across. It slicks across the nail unbelievably easily and looks incredible against pale skin. (Thank goodness, since I am always Casper white.) I can't even imagine a better polish choice for the week! I've got China Glaze Golden Spurs on my fingies and China Glaze For Audrey on my toesies. I wanted to use Scrangie this week, but it's MIA!